This was originally published on my other blog, but I think it works here, too. I know from comments I’ve received on previous posts that some of you are not fans of Apple. I’m not so much a fan of Apple, as I am a developer who has to work with Apple as we create iPhone/iPad Apps for our employees. I’m not trying to convince you to buy an iPhone, an iPad or a Mac. I don’t care what you use to do your job, pay your bills, process your photos or write your blog. If you’re happy, I’m happy. I use my iPhone for nearly everything one can do with a phone these days. I use my iPad in support of business, especially while traveling. I write my blog, process my pictures and do the bulk of my job on Windows laptops. My wife pays the bills. Regardless of what technology, platform (if my boss is reading this, his eyes just rolled) or operating system you’re using, occasionally, you need help. Sometimes, you have to deal with a large vendor’s myriad-level-deep-voice-mail-to-nowhere. Sometimes, your request is routed “off-shore.” Sometimes, you’re relegated to a web-based process, be it a chat or an email exchange. Quite often, you’re left on your own to google your way out of a deep hole. When I began my call with Apple’s Developer Support Group, I wasn’t optimistic. Mine wasn’t a technical issue, it was an account governance issue, and our two development accounts with Apple are governed (on their end) by over 2,000 pages of terms. I can’t share the details of my issue (try to hide that smile), but I want to share six things that AppleCare did well. So well that I would recommend that any organization, technical or otherwise, steal these ideas. Seriously, steal them! This is one case where you want to be like Apple. The questions speak to the things Apple is trying to achieve. 1) Four simple options – There was no guesswork involved in the simple voice mail prescreening message. Choices 1-3 were binary. They wanted to know if I was involved with three very specific things. I wasn’t, so I pressed 4 as instructed. 2) Hold Music Options – This is one thing that could make all tech-support / customer service so much better. I had the option to: hold with pop/rock, hold with classical music, hold with jazz or hold in silence. Please, steal this idea, even if you only add “hold in silence” as an option. 3) Fast & Accurate – I was expecting my ‘4 – other’ key press to lead me to a long wait. Instead, in under 3 minutes, a cheerful human being picked-up. Matt asked me several questions. He repeated back the important information, use phonetic “N as in Nancy” spelling to verify details like my email address, and he summarized my problem and stated his understanding of my objective. Oh my word, this guy actually wanted to make sure that he knew what I wanted as an outcome! 4) Information gathered and provided – Matt asked for a callback number, in case his attempts to transfer me failed. He also gave me the direct number of the group that he was transferring me to. He put me on hold (previous options, still in effect) for what initially seemed like a long time. Then Matt came back on the line and introduced me to Ashley. 5) Amazing – Number five is now known as “The Amazing Number 5!” I’m talking five golden rings amazing. When Ashley picked up she said: “Matt briefed me on your issue.” What? What tech support school did you guys go to? I was expecting Ashley to start at the beginning, run me through all the questions and then punt me to some no-nothing-schlep who would repeat the process. I didn’t have to repeat anything. She began with a summary of my problem and my expectations, as she understood them. She was correct. Ashley couldn’t help me achieve the objective I wanted, because Apple doesn’t permit the type of account management I wanted to establish. She did, however, offer an acceptable alternative. She carefully explained the alternative and I agreed that, while different than what I had hoped for, it would work just as well. 6) Insure success – Before hanging up, she asked me if I knew all the steps I had to complete and if I knew how to complete them. She listened while I explained my next steps, she confirmed that my understanding was correct, and she offered to stay on the line while I completed those tasks. Except for maybe giving Ashley a sweet southern accent, I can’t imagine anything that could have improved my experience. Again, I’m not shilling for Apple, but I do think there are some lessons to be learned from this experience. Picture Gildna Radner’s SNL character Emily Litella starting a monologue about wanting to bring an end to AIIM’s “see, I pee” promotion. Picture her rambling on until someone points out that “it’s CIP, as in Certified Information Professional.” Picture her offering up her classic: “never mind” and the skit would end. As much as it would be comforting, I can’t hide behind a misunderstanding. When I wrote my previous post “Ding Dong the CIP,” I knew what I was doing. I was trying to come to the aid of an association that I have great respect for, and to show support for a decision that I was party to making. I am writing this today, to acknowledge that the CIP is not dead. We don’t have the witch’s broom in our possession and we’re not going back to Kansas. The scarecrow can keep his brain, the tin man his heart, and the cowardly lion need not cower in the shadows of the forest, because, well, we’ve caused enough confusion, and besides, Christmas is only a week away. Seriously, I’d love to explore all things CIP in this post but, being mindful of the rapidly approaching holidays, I’ll do my best to be brief, and I’ll try to stick to the facts. We misjudged the importance of the CIP within the industry. We heard, loud and clear, from passionate members of our community that the CIP has value and we decided to work to fix the CIP instead of getting rid of it. I have no problem announcing this mea culpa because, I’d rather take the position of having been wrong than be accused of being obstinate after having been wrong. Fact – AIIM is working to meet the demands of a community of professionals that is rapidly growing beyond the ranks or ECM and ERM folk. The things I wrote about in my earlier post are also true. More and more people are dealing with more and more issues around managing information, and many of them don’t identify with Information Management as a profession. AIIM will now work to adapt the CIP to fit a broader and growing body of knowledge. Fact – no organization is more capable of meeting that challenge. Fact – AIIM is a viable and vitally important source for information about information. To the pundits that suggested that AIIM has had nothing to offer without the CIP, I would say “you couldn’t be more wrong.” The CIP is important, apparently more important than we realized. However, the CIP is far from the only good thing AIIM has to offer to the community of information professionals. Hopefully, the CIP can grow as the body of knowledge that it is designed to certify one in, grows. Hopefully, AIIM, the AIIM community and the industry that AIIM serves can help focus attention on the CIP going forward. Hopefully, this will cause more people to see the value in holding that certification, and hopefully those people will realize that AIIM remains the preeminent source of research, standards, education and communication around that growing body of knowledge. It’s a lot to hope for, but my history with AIIM tells me that it can all happen. I received, and accordingly I still hold a CIP. I have an ECMm and an ERMm. I still value the later designations more than the certification. The important thing is that when I needed to learn about handling information that doesn’t respond to a SQL query, I turned to AIIM and AIIM delivered. As that information grew in importance in my workplace, I continued to turn to AIIM for insight and guidance and AIIM continued to deliver. As that information worked its way onto multiple platforms, into the Cloud and onto my phone, I didn’t even have to turn to AIIM. People in the AIIM community had already prepared me for those changes. I heard them at Chapter meetings, at the AIIM Conference and, by proxy, through AIIM’s research, whitepapers and webinars. Whatever your feelings about the CIP, don’t confuse the certification with the Association. Don’t look upon the CIP as an end point that, once achieved lets you walk away from the community. AIIM has much to offer me, you and the entire community of information professionals and the industries that serve those professionals. Once good thing came from this mistake, the AIIM community showed that they can still get excited. More than ever, I am looking forward to the AIIM Conference in New Orleans and I hope to see you there. What are people saying about the last thing you built for them? The people who use the systems you build deserve the best experience you can give them. There. That’s it. That’s really all you have to read. If you are wondering how I came to that conclusion or why I’m bringing it up, feel free to continue reading but if you’re content to nod your head and even grudgingly agree with me, well then, off you go. OK, you stuck around. You know what that means. You’re going to have to read a story. Nuclear reactors get shut down for stuff like refueling and when they are shut down we charge them less for insurance. The way we do this is by dividing the year into a series of consecutive time intervals, each with its own set of state variables and its own pro-rata premium. Creating a new time interval was a big deal and a difficult process prior to the system we were writing. The designer wanted to make it easy. He wanted the system to show a list of time intervals and let the user highlight one and press the “+” key to insert a new time interval after the highlighted one. I knew that, but as far as I was concerned, that fact was irrelevant. She could learn. The feature was going to make someone’s job easier and that was worth learning how to do. Today, as we are in the early days of a new wave of development, I am more convinced than ever that the effort required to build a better user experience is a price worth paying. The math is simple. You build a system once every three to five to seven years but people use that system every single day. Where do you want them to register on the UI-O-Meter? “We don’t have time to do this” – Give them a choice of waiting a little longer or accepting a second phase to the project. “We can’t do that in SharePoint” – Buy an add-on feature or hire one of those SharePoint whiz-kid consultants who can. “This can’t be done in SharePoint” – Move the process to a different platform. “This would take too many development hours” – Do the math. Development hours vs. hours spent using a crappy system. If all of those fail, slap your hand on the table and sprinkle in a few bad words. If you have your own favorite excuse and an alternate way of looking at it, please add your thoughts to the comments. One of the goals that I have maintained throughout my career has been to add value to a process. Long before SharePoint, in fact long before (OK, little before) Microsoft, value was a key requirement in the systems I was building and designing. As a young systems analyst, I remember receiving strange looks from my “customers” when I would ask: “how would that report help you?” I used reports as an example because people always seemed to want more reports than they needed. Once, when I moved a system from one platform to another, I didn’t bother recreating 90% of the reports. I promised to build each one as the need became critical. I only ever recreated about another 5% of the missing reports. Don’t let me paint too rosy a picture. I’ve built my share of systems that missed the sweet-spot of the target and I’ve left more than a few valuable features laying on the cutting room floor. Systems development has always been affected by drama and budget, in addition to logic. I haven’t had much to share on this blog in recent months, but some projects are reaching a point where I can talk about them in generic terms. In most cases, I can’t talk about the work, because I’m not doing it. I can’t talk about the players, because some would rather not be a part of my blog entry. I can’t always talk about the details of the project because legal/accounting/human resources – ‘nuff said. But I can talk about goals and objectives and the way a focus on value has led us to some interesting decisions. Decisions I might not have made back when I started this blog and was bent on using SharePoint whenever possible. By way of introduction to what I hope is a small series of blog posts (maybe enough to satisfy @Sympmarc’s Saturday addiction) let me share a couple of thoughts on how we got to this point. Success moves you higher – I am old enough to have participated in systems development projects where the primary goal was to automate transaction processing and save money by eliminating jobs. Oh, we told ourselves that we were improving accuracy and letting people focus on higher-order tasks, but we were also letting them find those tasks at a different company. By the time SharePoint became available, we were way beyond that kind of development and we were looking for ways to use the information we had been gathering. SharePoint offered us a way to move up the hierarchy shown at the top, just a bit. 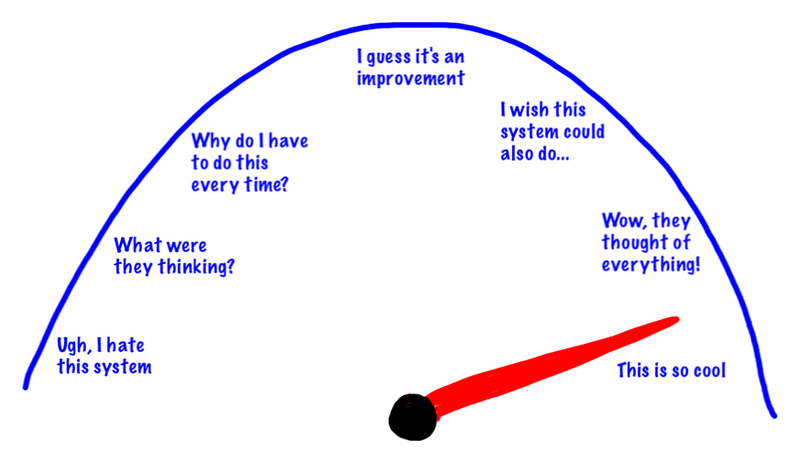 Failure also moves you higher – The reason I put the “Process Improvement” layer in quotes and in red and with the snarky bit at the end is because it wasn’t always the result. 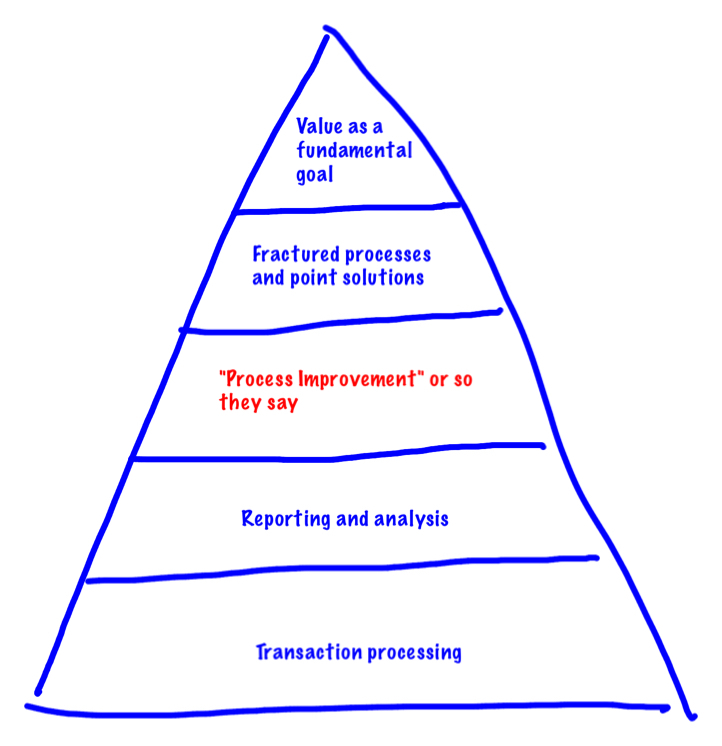 Often, process improvement was a collective bridge too far. Business leaders wanted magical solutions and technical managers and staff couldn’t wait to buy/build/use new toys in pursuit of that magic. There are times when you can run the table and automate the whole thing. There are also times when that would be a bad idea. The diagram above illustrates where we sometimes went wrong and how we are correcting those mistakes. Consider the five boxes across the top. Occasionally we have felt that we could automate all of them. In fact, we could. Unfortunately, automated analysis and decisions, by default become arbitrary. A report is on-time, because it is not yet late, or a report is late the moment the time allotted has passed. People on the other hand, understand that a report nearing its due date may be in trouble and people understand that sometimes life gets in the way of an arbitrary due date. Note: I have been doing this stuff since the ‘70s and yes, I know that systems can be made to be more holistic in nature. However, the effort in building those systems, as well as the effort to maintain those systems is very often too high. Humans are much better at making holistic decisions than machines. We have recently taken technology out of some steps of a business process that we had previously automated, in order to improve the process. Instead of automating all of the steps, we are focusing on “what information would help humans complete this step easier/faster/with better results?” I put this in the win column because we have the information we need (because we built good solutions in steps one and two). Now, by utilizing SharePoint’s native features, we can provide good information for people to consider in steps three and four. And yes, since nobody wants to do recordkeeping, we will automate that last step. That’s it for today. I have some stories in mind that build off of this foundation, but those can wait for another day. Maybe not next Saturday, but let’s keep this a Saturday kind of read. Their question is not quite correct and I am lying just a little bit. The problem with their question is that “SharePoint can be made to be so much more” but the making can take a lot of time. The lie that I’ve told is a lie of omission. I didn’t tell you that my box is bigger than Microsoft’s box. My box includes things like HarePoint Workflow Extensions and Nintex Workflows. HarePoint’s extensions add some very cool features to SharePoint Designer workflows and Nintex, well Nintex Workflows are like a slice of SharePoint Heaven here on Earth. So, truth be told, I like to show people what we can do very quickly in SharePoint with the tools that we have available to us. That’s important for a reason that most IT departments don’t consider often enough. Sometimes, people don’t ask for things because they think those things will be hard to build or expensive or that they will take too long. In the 2014 version of our SharePoint-driven walking contest, we have added two new features. Both are aimed at improving the user experience and both came at the request of my new young colleague Stacy. Stacy is not only the architect on this project, she’s the user. She’s managing the walking contest and she’s building the site with some help from me. Our company is divided into teams. Each person tracks and records their steps each day during the contest. At the end of the contest, the team with the most steps wins a team prize and the person with the overall highest number of steps wins an individual prize. Stacy wanted to make two improvements to the accounting process for the contest. She wanted to add options for mobile entry and she wanted a dashboard of sorts for reporting progress. Mobile entry was easy but, again, it uses a few tricks from our bigger box. You can send your entry into a SharePoint Remote Entry library by including the subject line “10-11-2014 8,996” i.e. the date and the number of steps. A SharePoint Designer workflow, aided by HarePoint’s Regular Expression actions parses the subject line and adds the steps to your step count. A second workflow adds your step count to your team’s total. We could do all the processing in one step, but I like breaking things into small chunks. That is a carryover from my history of coding in Smalltalk, but it’s a good practice for SharePoint. Small workflows are easier to test and they are easier to “debug” since there really isn’t a “debugger” available in SharePoint. 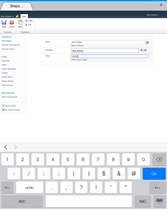 Employees with iPhones can also easily enter their steps via a mobile view of the Steps Entry form. Actually, anybody could do this, but “iPhone” is linked with “easy” because our MaaS360 mobile device management software allows us to push that mobile form through our firewall without the need for a VPN connection (which people hate to make on their phones). Finally, we needed to build that dashboard, but we decided to make it functional instead of just informative – that’s where the “one stop shopping” comes from. We started with a Web Part Page and we added an Announcement part and an Instructions part in those top-of-the-page whole width zones. Then we added three useful parts. On the left, we have “My Steps” which is a view of the Steps list filtered on the current user. In the center, we added a view of Team Status that shows the current ranking of teams and on the right; we added a simple entry form for steps. I have to admit, this is the first time I have ever put an entry form on a dashboard. It works. Having the entry form on the page makes this page the only thing people actually have to look at. My Steps, My Team and, as I look at my steps and realize that I forgot to enter yesterday’s value, I can do it without leaving the page. Stacy’s homework assignment is to add a chart to graphically display some of these statistics and to make the page a little prettier. Mine is to start walking. After 5 ½ years of sharing a weekly story, the regular nature of this blog has to come to end. It’s OK, you and I will both benefit from this change. I could go on about the state of the industry (which I might be able to accurately describe for a moment in time) or the state of SharePoint (sigh) but neither of those issues is driving this decision. This decision is being driven by the state of me. I am neither doing, nor managing enough activity around the subject of this blog to generate meaningful content on a weekly basis. I am still working. I am very busy, but not busy enough in this area. I am returning somewhat to my roots (systems development) and managing a small department as we prepare for the future. My stories are more abstract, more personnel (not a typo) and more nuclear (not a typo). Those combine to build a pile of ideas that are either hard to share or which can’t be shared without permission. Let’s look at the bright side: I benefit from not having to scurry to find something to say and you benefit by not having to read suspect quality material and my editor (wife) can relax a little on a few Saturdays. I appreciate the time you have spent reading this blog. I hope that you will stay connected to it so you can swing by for the periodic updates that will be coming. The best compliment I ever received was when Marc D. Anderson said that “SharePoint Stories is a Saturday kind of read.” I will try to keep true to that concept. This isn’t goodbye, it’s just a change. If we technology folks understand anything, we understand change.